Perhaps it is not often enough that I discuss my love of cheese. Hopefully this post will make up for all the times I’ve neglected to give special mention to what is very likely the best animal by-product on the face of this earth (well, tied with butter, anyways). At this point, you have probably come to realize that my European travels have been a little more food-driven than the average backpacking trip. I like good food and, just as it is the duty of tourists to visit the major sights of a city, I feel it is also my duty to try that place’s specialty food. In the Netherlands, it is cheese. This made me very, very happy. One of Holland’s most famous cheese purveyors is Reypenaer. This particular cheese company is well known because of their unique aging process. Their wheels age in a century-old warehouse with an unregulated temperature, meaning that special micro-cultures are introduced into the cheese. The warehouse’s cheese experts also clean each one of the 16,000 cheeses by hand and they have a man nicknamed the “Cheese Whisperer” who detects any holes and inconsistencies in the cheese. This stuff is clearly the top of the line. Lucky for Gord and I, Reypenaer has a large shop in Amsterdam. Even luckier? They have daily cheese and wine tastings for only 12€ (which may seem expensive, but, as you will see, we did our very best to get our money’s worth). Arriving at Reypenaer, we’re directed to the basement of the shop where the area has been transformed into a mini cheese tasting paradise. Gord and I take a seat and greedily eye up the six cheeses sitting in front of us. Even though we thought we were going to be the only cheese samplers under the age of 60, we were pleasantly surprised to be amonst a younger crowd. And by younger, I mean 40. Whatever. 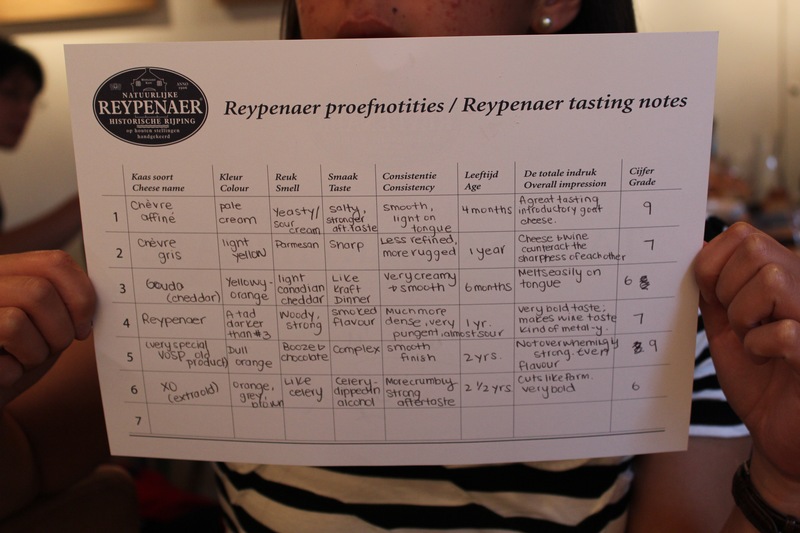 Our class began with an intensely-soundtracked shortfilm about Reypenaer cheese, after which we finally began our tasting. But hold your horses – think you can just pop the cheese in your mouth, chew and guzzle down a few gulps of wine? Think again. Before the cheese even reaches your mouth, you are required to make observations about both the colour and smell of the cheese. This is quite difficult when all the cheeses smell like, well, cheese. We were told that closing our eyes to smell the cheese (AKA looking ridiculous) helped detect the scent. After you’ve half BS-ed some sort of answer like “the cheese is a pale cream colour and has a woody, strong smell,” you can finally eat. STOP. Do not chew. Let the cheese melt on your tongue. This is crucial. The video at the beginning of the tasting said this melting process was extremely necessary. From here, it is time to describe the taste (my personal favourite: celery dipped in alcohol) and the consistency (less refined, more rugged…). At this point, most stop to ponder the deep cheese flavouring questions of the universe. As for Gord and I, we just kept cutting more cheese. Remember what I said about us getting our money’s worth? 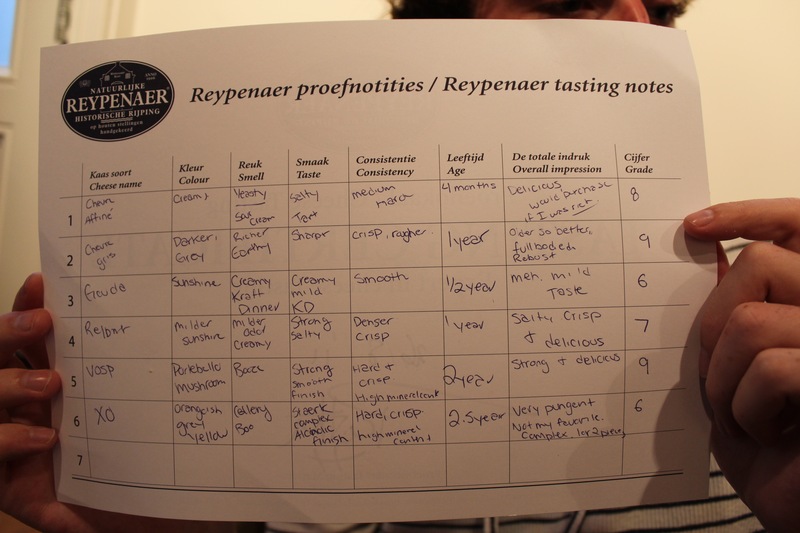 Below are my “tasting notes” from the day’s class, in which I attempt to recount my experiences with the six cheeses. Please don’t laugh at my embarrassingly unsophisticated palette (see #3 taste). 1. Goat cheese is different than cows cheese because of the different amounts of keratin produced by the animals’ stomachs. Since cows have four stomachs and goats only have one, this creates a different type of milk and, as a result, a different type of cheese. This difference is often most evident from the varied colours of cheese – goat cheese is white and cow’s cheese is more yellow. 2. Port wine is absolutely, positively disgusting. 3. The #4 cheese combines well with malt whiskey as well as 80% chocolate. 4. The crunchy, crystalized part of some cheeses is caused by the aged release of natural proteins, minerals and salts. 5. The last cheese we tasted, the XO (extra old) is particularly rare and famous because it is made from the summer milk of cows. It’s produced by cows that have grazed on fresh food all summer and whose milk is the best for keeping the cheese dense and compact which will allow it to age for longer without getting crumbly. In the end, Gord and I emerged from the basement full of delicious cheese and a little bit drunk off of good quality wine. Mission eat Dutch cheese: accomplished. Thanks for the good info. Going to Amsterdam next month and cheese tasting is high on my list. I love old Gouda cheeses! No worries – I love sharing my experiences, especially when they’re about cheese! Enjoy your trip!